Lots of stuff goes on in this shop, located in Lorette, Manitoba. Primarily it's the building and repair of classic wood & canvas canoes, and the making of premium canoe paddles. I also do custom boat building, composite fabrication, and special projects. A growing passion of mine is the making of classical guitars, I'll post about that, too. I want to be able to share with my clients the progress of their commissioned work. 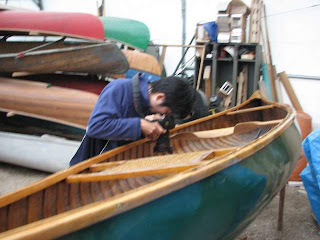 Later I started thinking that there might be other people who are interested in what goes on inside a wooden canoe shop operated by an artist and a recovering teacher. Hide (Heeday) was the second international visitor this week. 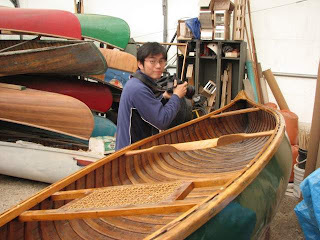 He is a Japanese photographer who who has been coming to North America for quite awhile is is very enamored with our wilderness and canoe culture. He knew more about wooden canoe history than most people who live here! Hide was working with a Japanese TV crew to put together a documentary on the Boreal forest. He got in touch with me while shopping for a wooden canoe that he could get right away for the production. In particular he was interested in the Bob's Special that I had in, he wanted to get some photos of what the Bob's looked like in 1948. Posted by Doug Ingram at 8:37 p.m.